I just found this bouquet from Scarlet Petal, a Chicago based florist and I am just smitten. 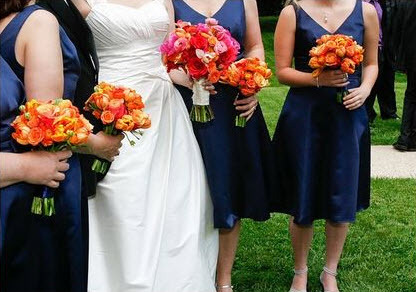 The orange and pink are fun and bright and would be perfect with my cobalt blue bridesmaids dresses. The clock is ticking on my planning- this past weekend marked 6 months till my big day. I'm not so stressed yet, but I know the time is coming. L.O.V.E. everything about this palate! Absolutely gorgeous! I would love a bouquet for a vase from those exact flowers. I used the pink & white cymbidium orchids and the looked and felt AMAZINGLY real. Even my bridesmaids couldn't tell. Plus I only spent about $400 for 5 bouquets, 9 boutts, & 6 corsages and all the shipping. 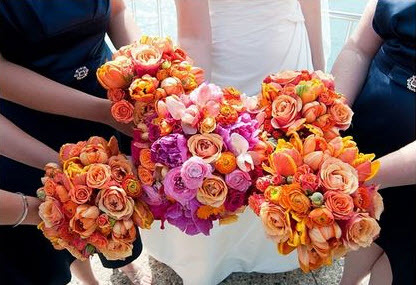 Oh, yes - pink/orange against the deep blue = GORG!!! I love that color combo! You have such a good eye. 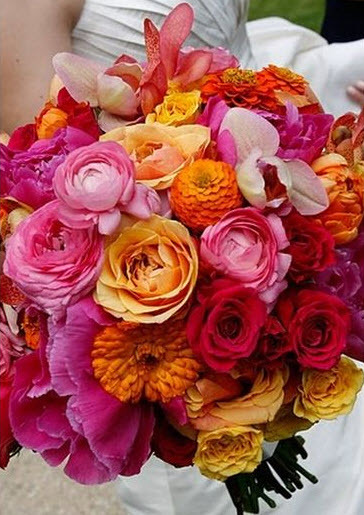 Such a vibrant palette - gorgeous!! I can't wait to see more of the planning ideas! Those were basically our wedding colors too! I like the idea of a darker cobalt blue though...we used more of a sky blue. Our flowers were dahlias in shades of oranges and pinks to look like the sun setting. it's getting close!!!! - flowers are gorgous! Wow...beautiful flowers!! I just love the colors! 6 more months...so exciting!! Love these and it's SO you! I say go with it. I will say beware though. I've changed my mind 14 times and last night had to decide finally. so scary! absoloutely gorgeous! These are all my favorite colors combined! I adore this color combination and I'm really loving it against the dark blue. Your wedding is going to be gorgeous! Scarlet petal is fantastic, for your readers in Chicago looking! I love this color combo too!